Time: 18:30 - 22:00 OPENING RECEPTION -Sponsored by Class 1 Inc. The Rooms is Newfoundland and Labrador’s largest public cultural space. Steeped in history, brimming with artistic creativity — modern, welcoming, and hip — The Rooms is an all-encompassing Newfoundland and Labrador experience. Home of the Provincial Archives, Art Gallery, and Museum. Attendees will be entertained by Gordon Quinton, veteran award-winning acoustic guitarist. Team Broken Earth is a volunteer-driven relief effort made up of doctors, nurses and other healthcare professionals from across Canada. The first team started here in Newfoundland in response to the dire need for medical assistance in the wake of the 2010 earthquake that leveled Port-au- Prince, Haiti, killing over a quarter of a million people and injuring countless more. Seven years removed from that devastating earthquake, the team has grown to be a nation-wide effort, and has expanded to include relief work and assistance in Nepal, Bangladesh, Nicaragua and Guatemala. Team Broken Earth’s mission is threefold. First, we believe in providing a sustained medical relief effort to those who need it most. We’re there until we are no longer needed. Second, we believe that education creates sustainable, ever-lasting change. Finally, as our organization matures we look to continue our ongoing research activities measuring outcomes and deliverables that result from our efforts. Build it Right Now to Save Lives in the Future - Sponsored by Roger Enterprises Ltd.
Healthcare Facilities Acquired Infections (HAI) have become a key focus for many healthcare organizations and regulatory authorities. Often, HAI are due to pathogens deposited during construction from years or decades ago. These pathogens are raised during renovation and maintenance activities. By implementing innovative construction techniques during new construction, these legacy HAI’s can be significantly reduced and potentially eliminated. 1. Attendees will gain practical knowledge of methods to create the culture of infection prevention at the earliest stages of construction. 2. Attendees will receive a real numbers from real construction as to the costs associated with a major infection prevention program on Greenfield construction sites. 3. Attendees will take away tools with which to “sell” a strong program to senior leaders in the construction industry or to their health care clients. When Risk becomes a Reality; Behind the scenes of an Aspergillus Investigation - Sponsored by Pinchin Ltd.
For many working in health care design and construction, the link between construction and patient risk is an abstract, theoretical one. This presentation will provide a detailed look into the investigation of an increase of invasive Aspergillosis infections within an acute care institution in downtown Toronto. It will walk attendees through the enormous task of defining hospital-acquired cases, attempting to uncover the source, the significant cost and time dedicated to the investigation, and the negative impact to patient care. Emphasis on the importance of preventive measures in all maintenance and construction activities, whether they occur within the walls of the health care facility or outside will be a main focus. Toronto General Hospital’s 5400 ton chilled water plant has been reconfigured and modified over many years. This has led to an inefficient, poorly functioning, and unreliable system, costing UHN $2.6 million a year in electricity. To develop solutions a detailed engineering assessment was conducted. This included an hourly simulation, detailed business cases, and a multivariable sensitivity analysis of several upgrade options. As a result UHN has invested in an upgrade utilizing Enwave’s deep lake district cooling system, entering into a 20 year agreement for chilled water services. 1. Step through the process of developing a rock solid business case (with sensitivity analysis) to communicate with senior leadership and key stakeholders. 2. Show how energy saving projects can provide more value to an organization than just operating cost reductions. 3. Communicate the key steps in the chilled water investigation process and lessons learned in identifying issues. 4. Highlight how data is fundamental in identifying existing issues, creating a reliable business case, and in developing a well-functioning design. Time: 12:00-14:00 LUNCH in Exhibit Hall - Sponsored by Klenzoid Canada Inc.
Upping the Game- How the new edition of Z8000 is shaping health care design for the next decade - Sponsored by Reliance Worldwide Corporation (Canada) Inc. Safe and effective service delivery needs safe, effective, and well-designed health care facilities. The first edition of Z8000 did two things: it codified Canadian and international best practice to create a common design reference for health care, and it pushed the field to accept new ideas that would improve patient outcomes. Presenters will describe how the new Z8000 edition addresses technological advances and changes to service delivery models while continuing to promote supportive environments where people can safely live, work, and heal. The presentation will focus on optimization of the healthcare environment through building and energy analytics software, which aims to better serve patient and healthcare facility operations staff. The outcomes at New Brunswick healthcare facilities will be shared, as well as challenges and lessons learned. 2. Demonstrate how to identify, collect, integrate, manage, and understand building data — and how it can be turned into actionable information. Outcomes in a New Brunswick Healthcare facility will be presented. 3. Assist attendees to understand how advanced building analytics can be used to enhance fault detection and system diagnostics which will have impact on thermal and humidity levels as well as better service areas such medical equipment requirements. 4. Describe the value of building analytics and the ability to improve an energy management program including return on investment and project measurement and verification with respect to targets. Engineered Infection Prevention - Sponsored by Plumbing Plus Ltd. Engineered Infection Prevention (EIP) is a game-changer for hospitals. EIP includes automated technology and materials incorporated into healthcare infrastructure designed to eliminate air, water and surface transmission of disease. EIP was named a 2017 Top 10 World Patient Safety Innovation by the Patient Safety Movement and is rapidly being adopted by leading hospitals and Ministries of Health across Canada. This presentation will provide an update on EIP research, technologies, implementation, and standards. 1. Identify opportunities and challenges to deploying EIP in existing facilities. 3. Specify EIP materials and technologies when considering future projects. Hospitals today face many challenges in delivering outstanding patient care at a reasonable cost. Technology offers opportunities to improve healthcare efficiency and support patient-centered care. This program overviews how incorporating smart robotics into healthcare design provides engineers and their clients with solutions to logistics and workflow challenges. Maximizing Emergency Department Capacity By Design: New Workflow + Flexible Environments - Sponsored by Martak Canada Ltd.
Capacity is a challenge for nearly every emergency department (ED) across Canada. Reshaping operational flow, staffing patterns, and the physical environment can elevate capacity and streamline care for the patients resulting in a high-performance ED. Sample projects from across Canada, as well as other ED projects around the world that impacted the design of recent Canadian ED projects, will be presented to document how rethinking flow and architecture can result in tremendous project success. 1. Identify the key operational and facility data points that need to be considered when approaching a comprehensive emergency department design solution. This presentation describes the development of a design guide for purpose-built infrastructure to support the emergence of collaborative care teams, called Patient-focused Primary Health Care. Design Guide for Infrastructure Supporting Collaborative Health Care Teams (Design Guide). The presentation will provide a detailed description of the Design Guide, the key outcomes for the specific detailed requirements, and how they relate to the healthcare environment, the care providers, quality, patient safety, and the patient experience. Time: 10:15-10:45 REFRESHMENT BREAK in Exhibit Hall - Sponsored by CORE Engineering Inc.
Time: 10:15-10:45 CHES CCHFM Prep Course - Targeting Challenges through Certification – Why CCHFM? Why me? And why now? This presentation starts with an overview of the competencies with which an individual should be familiar in order to challenge the Canadian Certified Healthcare Facility Manager exam. Competencies such as compliance; planning, design and construction; maintenance and operations; finance; and administration will be explored to get a sense of exactly what is to be expected in a certified individual. We will explore why you should consider challenging the CCHFM exam to demonstrate your competence in the complex field of Healthcare Facilities Management. We will spend some time discussing highlights as well as presenting the types of questions answers that you might expect when taking the exam. This session presents the issue of maintaining the required relative humidity (RH) level within an operating room (OR) setting in an academic health sciences center with a 734-bed acute care Hospital. Problematic RH levels, methods of dealing with and solving the RH control level will be discussed in this session. Attendees will learn how the application of liquid desiccant dehumidification technology resolved the unacceptable RH levels within the Hospital OR suites. Hospital construction projects are unique in their complexity and the success of any project, from a small-scale renovation to a capital renewal project, is not accidental. What are the steps to ensure minimal disruption to hospital services, consistency in care and ultimately, protection of patient health regardless of the size of the project? It is our goal to outline 5 key steps that will aid you in planning a “successful” construction project for your facility. 1. Identify the foundational elements for a successful construction project in their facility. 2. Assess the effectiveness of their current project process. 3. Identify opportunities to integrate a “patient-first” approach into their construction projects. Technology is driving industry-wide change in how we approach healthcare construction, including project communication; design and renderings; costing and scheduling; and space planning beyond immediate needs. What does this mean for healthcare construction and how does a change in the traditional spending model ultimately affect the patient experience? DIRTT Healthcare Director Kristin Moore takes a practical and informative look at manufactured interior construction and its impact on healthcare. • Understand where a construction budget goes and what gets value-engineered out when budgets run tight. • Identify specific impact areas on sequencing; process changes result in reduced construction schedules, measurable cost savings in CSI divisions and on-site installation versus on-site construction for a safer, faster and cost-efficient build. St Michaels hospital had 3 challenges ahead of them in 2016. Build a modern new wing to their hospital; fill it will modern technology to drive world class patient experience and clinical outcomes; and integrate it within an existing healthcare ecosystem!. This presentation will focus on the holistic approach implemented at St. Michaels, and the successful outcomes achieved throughout 2017-2018 with their Hospital Expansion project and applied use of digital healthcare technologies. Dr. Stephanie Taylor, CEO Taylor Healthcare Commissioning Inc.
Time: 18:30-22:00 Opening Reception - Sponsored by Class 1 Inc.
Before July 31, $109.25; After July 31, $120.75. Join us in Crush Lobby for the President's Reception to network with friends! The Gala Banquet will celebrate the accomplishments of our peers with the 2018 Awards presentations, while enjoying great food and entertainment with friends. The Spirit of Newfoundland Cast provides a colorful vocal and theatrical stage show that features 4 vocalists, an exceptional band, and an irreverent host. A quality night of great performance, fun and laughter for all. The Great CHES Golf Game will take place at the Clovelly Golf Club. Clovelly boasts two immaculately groomed courses by award winning architect Graham Cooke. 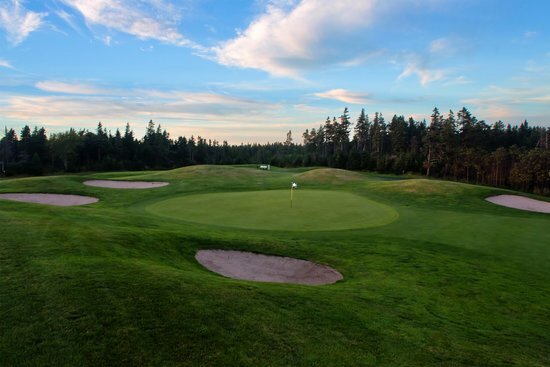 The Great CHES Golf Game will take place on the Osprey course which is routed through the traditional landscape of the Avalon Peninsula, natural wetlands, small scenic ponds and surrounding forest. It is an excellent mix of holes, showcased by demanding, yet playable Par 5’s, short and medium length Par 3’s and a perfect mix of Par 4’s. $25 plus 15% HST for Regular Set or $45 plus 15% HST for Executive Set. This tour will go "around the Bay" along the picturesque coastline of Conception Bay, the home of pirates of centuries ago. You will stop in Holyrood to search for ‘Lucky Rocks’ on the beach. The tour will also stop for picture taking as we make our way to Brigus, one of the historic sailing ports of Conception Bay and home of the late, famous Captain Bob Bartlett who took Perry to the North Pole. Here you will have the opportunity to visit Hawthorne Cottage and take ‘The Walk’ around the community. Participants will have Lunch in Cupids, one of the oldest settled communities in Newfoundland. This area celebrated its 400th anniversary in 2010 of John Guy establishing a colony in this area for the Merchant Venture's in Bristol, England. After lunch you will take a walk through the museum in Cupids and visit the archaeology site where the old colony is being rediscovered. Your guide will regale you with the history culture and language of the Newfoundland people. A tour of old St. John's with plenty of time to see such National historic sites as Cabot Tower, Signal Hill, the Anglican Cathedral of St. John the Baptist and the Basilica. Hear the legends of Dead Man's Pond, and Government House and the history surrounding the Colonial Building. This tour will orient you and give you a feel for the history, legend and lore of St. John's, the oldest community in North America. Then you will head off to visit the National Park at Cape Spear, the most easterly point of land in North America. Here the lighthouse has been restored to circa 1836. Explore the bunkers built by Canadian soldiers in the side of the cliffs during the Second World War. Now you can say you have been to the other "Far East" where you can stand with your back to the Atlantic and face every other being in North America - or turn your back on them. The choice is yours. Throughout the tour we will be visiting various sites around the city to sample some of Newfoundland’s fine fares: a beer tasting at the Quidi Vidi Brewery (with a serious focus on fun); and the Newman Wine Vault for a drop of their legendary port and a taste of the Newfoundland Chocolate Company’s delicious creations. Lunch will be provided at one of St. John’s’ many exceptional restaurants. The new PET/CT scanner is leading-edge medical equipment that offers improved assessment, diagnosis and treatment of certain types of cancer, cardiac disease and some neurological disorders. The scanner combines two diagnostic tests into one, offering a unique representation of what is happening in the human body. While the CT part of the examination provides structural information about human anatomy, the PET scanner provides functional information about how the patient’s organ systems work. The total cost for constructing of the new Nuclear and Molecular Medicine facility and acquiring the new PET/CT scanner, cyclotron, furniture and equipment amounted to approximately $50 million. In conjunction with the PET/CT scanner, Eastern Health is also operating a cyclotron, a device used to create medical isotopes. Medical isotopes are used in PET/CT imaging, as well as some other diagnostic imaging procedures currently available through Eastern Health’s Nuclear and Molecular Medicine Program. As a cyclotron creates radiation, the regulatory processes for operating a cyclotron are extensive. There are two principal federal regulatory agencies involved – Canadian Nuclear Safety Commission (CSNC) and Health Canada. Several safety features have been built into the space that now houses the cyclotron, such as extra thick concrete and lead walls, safety monitoring systems and security features. Any waste or excess materials produced by the cyclotron is properly stored and monitored according to federal safety regulations, and properly and safely disposed at federally regulated and approved disposal depots.